My big boy turned 4 last month! Such a cliche but he is growing up so quickly. Although he had been asking for a party we decided to keep it low key and do a family outing instead, especially as his birthday fell on a Saturday this year. Oscar has always loved animals and nature so we decided to head off to Australia Zoo for the day. This is the zoo that Steve Irwin founded on the Sunshine Coast and is a brilliant place to visit with kids. There is heaps to see so I would recommend getting there as soon as they open if you are to have any chance of seeing it all in one day! We were a little late getting there (having a few toilet stops on the way for the kids) and I had also stupidly invited more family over for birthday cake at home at 4pm. What I hadn't figured on was getting home by 4 actually meant rounding everyone up to leave the zoo about 2.30. Not surprisingly we didn't see everything we wanted to. Oh well, live and learn. Anyway, we all had a great time. The kids loved seeing all the animals, the giant tortoises, the bird show and of course the crocodiles were big hits. And we still had birthday cake at home to look forward to. Oscar had been asking for a dinosaur cake for at least 6 months so I had plenty of time to research. I pretty much just googled 'dinosaur cake', looked through all the images and chose one something that looked easy (I found this one here). And it turned out pretty well if I do say so myself! 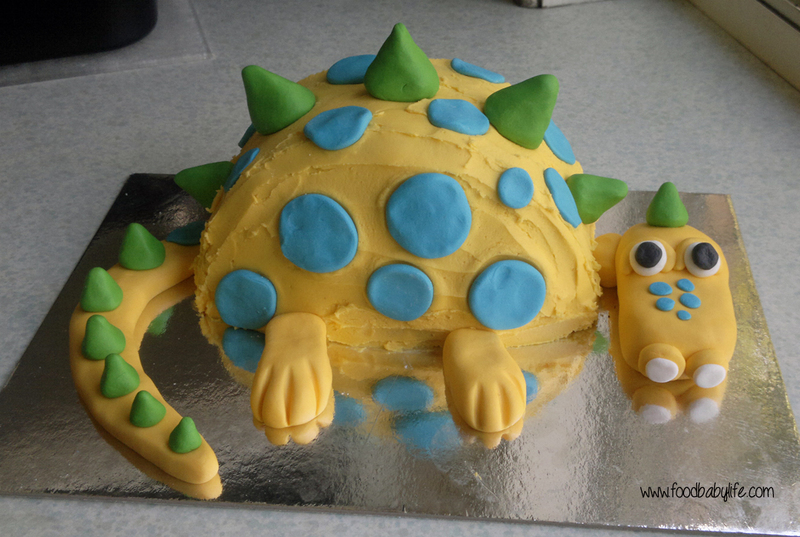 The body of the dinosaur is an 8 inch round cake split in half and sandwiched together with icing to form a semi-circle shape. As we are trying to stay sugar-free I chose to bake the vanilla cake from David Gillespie's Sweet Poison Quit Plan Cookbook, and then used a normal sugar icing. The head, tail, legs and spots were made from ready-made fondant icing that I tinted myself using mostly Wilton gel colours. I was really happy with how the colours turned out, they were just what I was hoping for. It was a lot of fun making the shapes too, a bit like playing with play dough! So another year, another birthday cake. Stay tuned for Charlie's birthday in November! Ah, I love it! Such a beautiful cake. You did a fantastic job. Happy Birthday!